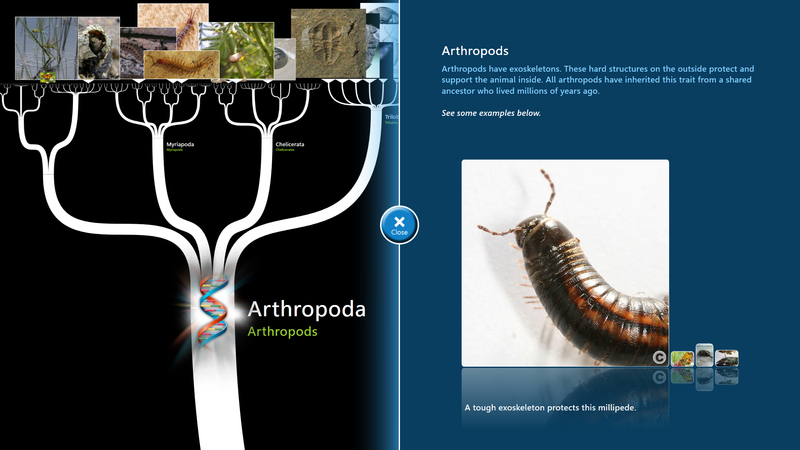 "DeepTree" is a multi-touch, interactive application that allows users to see how all life on Earth is related. How are humans related to other life forms? What traits do bats share with bananas? Do beetles share a common ancestry with fish? Explore questions like these and the complex evolutionary relationships of over 70,000 species with the touch of a finger on the Tree of Life -- a new installation at the University of Nebraska State Museum of Natural History in Morrill Hall. The Tree of Life, made possible by a grant from the National Science Foundation, allows multiple users to learn about life on Earth using innovative touchscreen technology. It will be unveiled in the Explore Evolution gallery on Feb. 22. Morrill Hall is south of 14th and Vine Streets on the University of Nebraska-Lincoln City Campus. The Tree of Life provides an engaging format to visualize 3.5 billion years of evolutionary history. 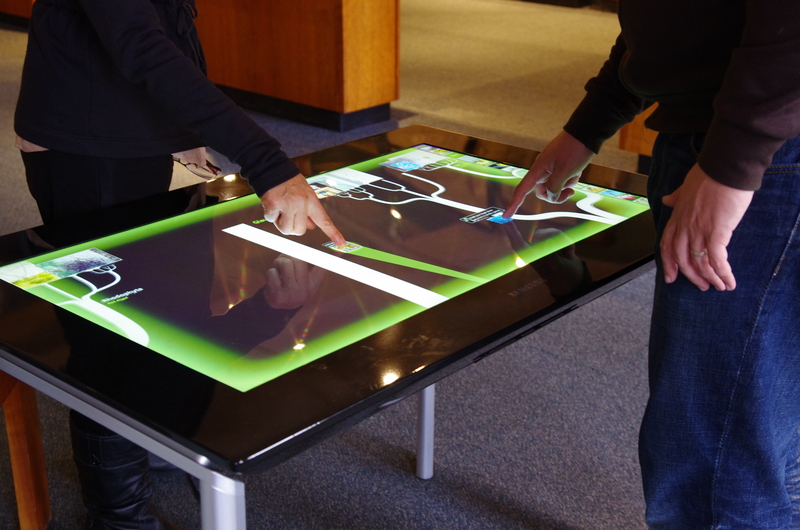 A swipe of the finger on the multi-touch table allows the user to zoom through the phylogenetic tree, called DeepTree, to see how all life on Earth is related by common ancestry. For example, users can search the tree to see how bananas are related to people or how giraffes are related to bald eagles. The Tree of Life is the result of a multi-institutional collaboration including Judy Diamond, professor and curator of informal science education for the NU State Museum. Diamond served as co-principal investigator with Chia Shen from the School of Engineering and Applied Science at Harvard University, Mike Horn from Northwestern University, Margaret Evans from the University of Michigan, and postdoctoral fellows Florian Block and Brenda Caldwell Phillips at Harvard. This three-year, $2.3 million dollar NSF grant developed the exhibit for four museums in the United States. In addition to Morrill Hall, the Tree of Life will be installed at the Harvard Museum of Natural History in Cambridge, Mass., the California Academy of Sciences in San Francisco and the Field Museum of Natural History in Chicago. "The tree of life is a central organizing principle for all of natural history, but it is not easy to understand. This exhibit gives users the opportunity to playfully explore the tree of life and learn how all life on Earth is related," Diamond said. The Tree of Life will be incorporated with the museum's educational programs for schools and the general public to teach evolutionary concepts such as common descent and natural selection. It will also be integrated into a new course sequence for students in the UNL School of Biological Sciences in fall 2013. Students will use it to simulate evolution -- connecting genes to individuals, populations, and evolution. For more information on the Tree of Life, including images and video, visit https://lifeonearth.seas.harvard.edu. The University of Nebraska State Museum of Natural History in Morrill Hall is open 9:30 a.m. to 4:30 p.m. Monday-Wednesday and Friday-Saturday, 9:30 a.m.-8 p.m. Thursdays, and 1:30-4:30 p.m. Sundays. Regular admission is $6 for adults (19 and over), $3 for children (5-18 years, 4 and under are free), and $13 for families (up to two adults and children). UNL staff, faculty, and students are admitted free with UNL ID. Friends of the Museum are also free with a valid membership card. There is an additional charge for planetarium shows. Parking is free in front of the museum. For further information, telephone the museum at 402-472-2642, or visit www.museum.unl.edu or Mueller Planetarium's website, www.spacelaser.com.